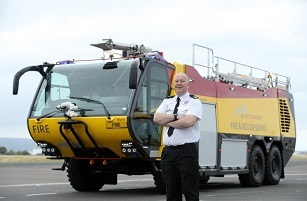 BELFAST, Northern Ireland, 2018-Sep-07 — /Travel PR News/ — George Best Belfast City Airport Fire Service has taken delivery of the first of three new fire tenders, each representing an investment in the region of £1 million. Purpose built for the airport by the Spanish firm Iturri, and the culmination of a 5-year procurement and manufacturing process, the new fire appliance offers the latest technology in aviation fire-fighting and rescue. The 33-tonne vehicle can deliver 45,000 litres of foam every minute, has a top speed of nearly 80 mph and can operate in zero visibility. It’s the first of three new tenders scheduled to arrive at Belfast City Airport as the airport ensures its continued compliance with the highest safety regulations. “Belfast City Airport Fire Service is responsible for safety of all aircraft within the airfield. “In addition, our 33 full-time fire fighters are trained first medical responders to the three million visitors to the airport each year. “The new fire appliance was custom-built in Seville and comes equipped with full thermal imaging and infra-red driver vision, meaning the tender can operate in zero visibility. It can also fight fires whilst on the move, carrying 11,500 litres of water. “The arrival of the first of three fire tenders is part of an overall £15 million capital investment programme at the airport which, when complete, will include a new security search area and refurbishment of the departures lounge with an enhanced retail offering. This entry was posted in Airports, Travel, Travel Safety, Travel Services, Travelers and tagged Fire Service, George Best Belfast City Airport, Mark Beattie, Seamus MacMahon. Bookmark the permalink.